Three sandbaggers along the Pemberton dike by John Stearns of The News-Sentinel. I was 7 when Fort Wayne’s three rivers overflowed their banks in March 1982. Thousands evacuated their homes as snow melted, rain fell, and dikes leaked. Yet everyone praised sandbaggers, most of whom were teenagers. Today and 36 years later, I live in New York City. I recently began collecting clippings on the Great Flood of ‘82. While I can see photos online or hear first-hand stories from friends and family, I prefer to touch paper and ink—no “fake news”—to make sure President Ronald Reagan really did visit and that my hometown was indeed “the city that saved itself.” Now 43, I’m just starting to comprehend the flood’s significance. 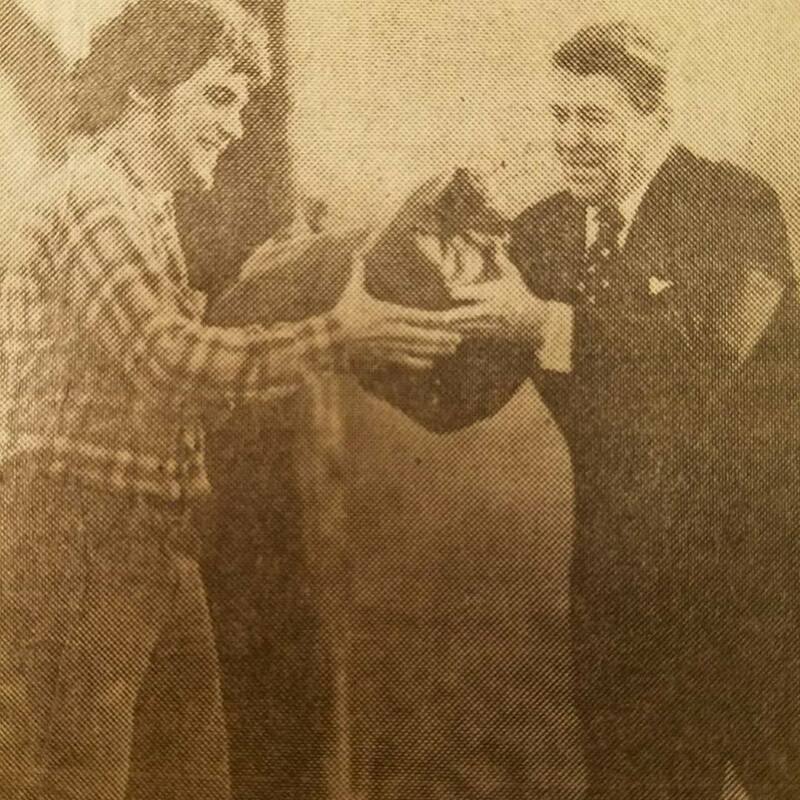 President Ronald Reagan with a sandbag, byMike Hanley of The News-Sentinel. During visits home, I always stopped by The Sandbaggers, a bronze relief sculpture that graced the lobby at the Fort Wayne International Airport and now lives in Citizens Square. Adolescents are the heroes in that sculpture, with adults in the background waiting to be saved. Feeling sad after yet another school shooting, I wandered into the New York Public Library and peppered librarians with questions about the Great Flood. Major publications praised Fort Wayne’s teens. The Christian Science Monitor reported that half of the community’s high school students volunteered to build dikes, visit shelters, or prepare food for workers. One article in The New York Times mentioned Fort Wayne’s high jobless rate, stoked by major layoffs from International Harvester on the east side of town. Yet the city’s children, not old enough to vote, kept filling sandbags and singing through the night. “In the early evening darkness, almost every face you saw in the street belonged to a kid,” reported Dan Luzadder in the March 29, 1982 special flood edition, of The News-Sentinel. His story, ”It’s the children who are saving us,” appeared alongside a photo of three students resting on the Pemberton dike. The spectacular picture, by the late John Stearns, took up most of the page. Wanting to hold onto the magic that helped The News-Sentinel win the Pulitzer Prize for local reporting, I bought this fragile edition on Amazon. Throughout the month of March, I sat on my couch and read the paper, pretending to have feathered hair and no prior knowledge of Facebook or even the internet. Meanwhile in real time, Fort Wayne’s high schoolers showed up in public places to support March for Our Lives after the school shooting in Parkland, Fla. Not all Fort Wayners appreciated the protests. I sent letters to the editor to both The News-Sentinel and The Journal Gazette comparing peaceful protests to the youth movement during the Flood of ‘82. I heard silence. So I wrote back again, even emailing specific editors. I just wanted a reason. Nothing. A third Fort Wayne publication told me the subject was too controversial and didn't want to touch it, so I backed off, for a while at least. I know my hometown has an almost religious reverence for the flood—I do too, having lived through it. Yet I can’t help but notice the similarities between young people who fought the Great Flood and modern teens marching for safer schools throughout the country and the world. I don’t see the conflict in comparing the two.